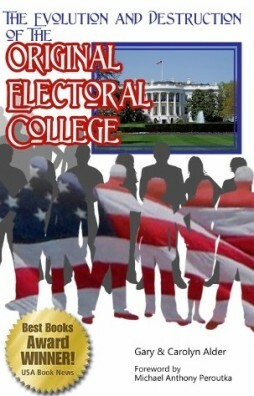 In order to adequately explain what we call the shortcut, we must focus on the objective of the whole Electoral College System which is to find the best possible presidential candidates. A consensus of independent Electors as the nominating votes are counted would indicate an extraordinary individual has been identified. If the individual with the highest number of electoral votes was nominated by a majority of the Electors, the final vote of the House of Representatives is bypassed. If more than one individual has that distinction, the final vote goes to the House anyway. The system was designed so that the Electors themselves would not have the means to force the shortcut by having the Electors meet in their respective states on the same day. The Framers also depended upon the independence of the Electors which means that the concurrence of electoral votes would be a matter of coincidence rather than design. Technically up to three individuals could tie with votes from over half of the Electors because each Elector submits two names. Speaking in percentages, a president could be elected with a vote of just over 50% of the Electors. Since each Elector casts two votes, that would be just over 25% of the total electoral votes. Although we believe this would be very unlikely to happen, it is possible. This also demonstrates that both persons named by an Elector have equal weight in the vote counting. There is no provision for a first and second choice. Please keep this point in mind as we proceed to discuss the other versions of the electoral process. In Federalist No. 68 Alexander Hamilton describes this same concept, although with some inaccuracy (as a somewhat rigorous study of the above paragraphs shows). of electoral votes is not sufficient to bypass the election process by the House of Representatives; nomination by a majority of the Electors is required. Unless one individual is obviously more qualified than anyone else, the Electors will submit many names. Let us describe it another way. If the individual with the highest number of nominating votes was nominated by over half of the Electors—in a situation where the Electors would not know the outcome from the Electors in other states, no final election is needed. It is obvious that a person that outstanding should be president. This was the case with our first President, George Washington. Besides being the General who led in the fight for independence, he was so influential that there would not have been a Constitutional Convention had he not been there. It is no surprise that George Washington was chosen as president of the Constitutional Convention. When it came time for the Electors to nominate outstanding individuals as presidential candidates, he would be high on the list of patriots. In fact, George Washington was unanimously nominated. His name was one of the two names submitted by each Elector in 1789 and also in 1792.
so that everyone would know that he would retire at the end of his second term. This created a problem for future Electors because the most obvious choice was now unavailable. Even after making it clear that he would not accept the nomination, in 1796 two Electors voted for George Washington. In the election of 1796, John Adams, who served as Vice- President to President George Washington, received the nominating vote of a majority of Electors. Thomas Jefferson received the next highest number of electoral votes and became Vice-President. There is some evidence that we were starting down the path to party rule in American politics by attempting to force or manipulate the shortcut, but we will address that later. Let us now discuss the election process in the House of Representatives.